Should You Buy Home Depot (HD) Stock Before Q3 Earnings? Home Depot HD helps kick off the retail-heavy portion of Q3 earnings season next Tuesday, ahead of reports from Macy’s M, Walmart WMT, and other giants later in the week. The question is should investors consider buying Home Depot stock ahead of earnings? Let’s see what to expect and look at some of its current fundamentals to find out. 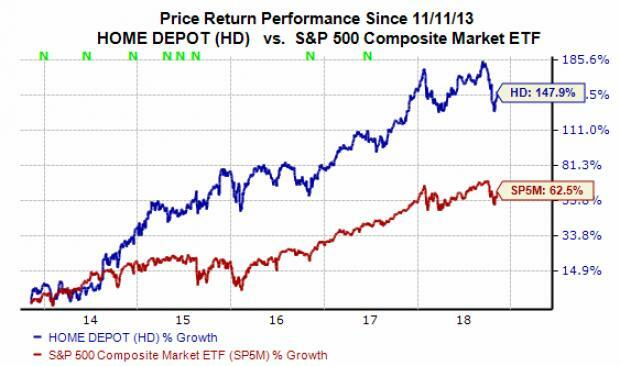 We can see in the chart below that Home Depot stock has crushed the S&P 500 over the last five years. Home Depot stock has climbed over 50% in the last three years, with much of that expansion coming in the last 24 months. With that said, the last year has not been as kind to the home improvement retail powerhouse. Shares of HD are up roughly 14% in the last 12 months, but have slipped around 1% since the start of 2018. Plus, Home Depot stock is down nearly 6% during the past three months. Home Depot stock closed at $ 187.23 per share on Wednesday, down 13% from its 52-week high of $ 215.43 per share, which sets up what could prove to be a solid buying opportunity. Moving on, HD is currently trading at 18.6X forward 12-month Zacks Consensus EPS estimates, which marks a significant discount compared to its industry’s 25.7X. Home Depot is trading slightly above its rival Lowe's LOW at 17.3X and the S&P 500’s 16.8X. But HD has traded as high as 23.7X over the last year, with a one-year median of 20X. The company is also trading not too far above its 52-week low of 17X. We can also see that Home Depot is trading below its five-year median of 19.9X. Therefore, HD’s valuation is picture hardly appears stretched at the moment. Now that we have covered Home Depot’s current valuation picture and its stock price movement, it’s time to take a quick look at its business and understand what we should expect from the company’s third-quarter financial results. Home Depot is the world's largest home improvement retailer and boasts 2,286 locations. The firm did $ 100.9 billion in sales last year, up 6.7% from fiscal 2016. Looking ahead, our current Zacks Consensus Estimate is calling for Home Depot’s third-quarter revenues to jump by 4.9% to reach $ 26.25 billion. Meanwhile, HD’s full-year revenues are projected to surge 7.3% to touch $ 108.23 billion. At the other end of the income statement, Home Depot’s adjusted quarterly earnings are projected to pop 23.4% to land at $ 2.27 per share. Better yet, the home improvement giant’s fiscal 2018 earnings are expected to climb over 28%. It is also worth noting that Home Depot’s comparable store sales are expected to climb 4.7% based on our current NFM estimates—total comps jumped 5.3% last quarter. Furthermore, Home Depot’s overall customer transactions are projected to climb by roughly 4%, with its average ticket expected to pop from $ 62.84 to $ 64.74. Investors should note that Home Depot’s earnings estimate revision activity has trended downward over the last 30 days to help HD earn a Zacks Rank #3 (Hold). Yet, HD sports an “A” grade for Growth in our Style Scores system and its stock rests below where it has traded recently. Plus, Home Depot almost always tops our quarterly earnings estimates, with beats for over five straight years. It is also worth remembering that Home Depot is a solid income stock. This helps it look more attractive, especially during market uncertainty. Better yet, Home Depot has significantly increased its quarterly dividend over the last few years. HD paid a cash dividend of $ 1.03 per share in the second quarter, which marked a nearly 50% jump from 2016’s $ 0.69 per share and a 16% climb from 2017’s $ 0.89. Home Depot is scheduled to release its Q3 financial results before the opening bell on Tuesday, November 13. And it looks like Home Depot stock might be worth considering.